No really, do it now. I’ll wait. If you are still reading, I am going to assume that a pizza crust made with 3 kinds of cheese, eggs, and no flour is RIGHT up your alley! I will admit that while I am 99% grain free (other than an occasional delectable sushi roll, oops) even I was feeling a little guilty with this cheesy indulgence, but it sure was good! Many of you have either found me through my posts on the Wheat Belly blog or Facebook page, and even if you found me through the wonderful world of food and health blogging, you likely know how enthusiastic I am about the wheat free lifestyle! One of the cool things about being part of a thriving Wheat Belly (WB) community online is that everyone is more than happy to share their experiences, advice and recipe tips! 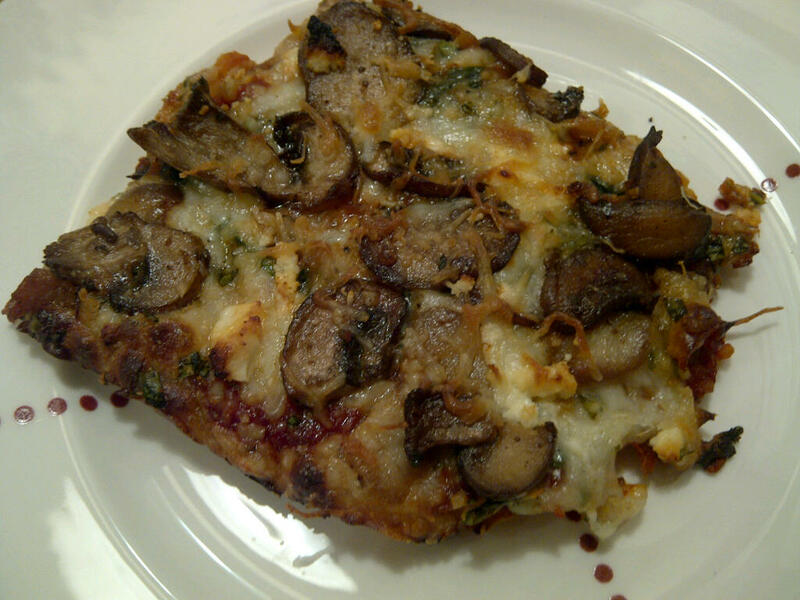 In a recent post, after I suggested the Socca Pizza crust with Garbanzo flour, a fellow WB’er shared her favorite gluten-free pizza crust recipe (which is veryyyy low carb), and I gave it a whirl… YUMMO! So, since one good turn deserves another, I am sharing the link to the original page HERE, at Gluten Free Easily, with pictures of a very classic-looking pepperoni pizza. I will definitely have to make this version when I have pepperoni on hand, but since I didn’t, I improvised with what I did have. 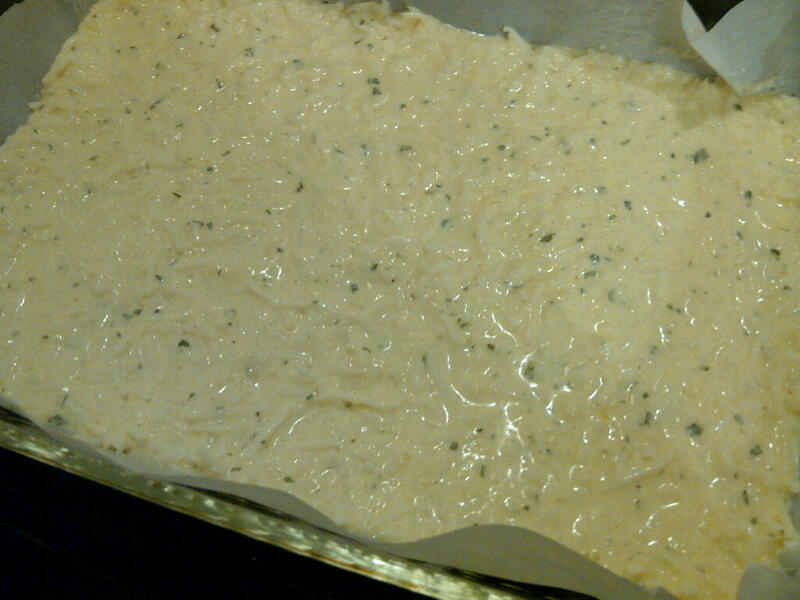 Here you see the crust ingredients spread into a parchment-lined pan. Cooked up and ready to be decked out! 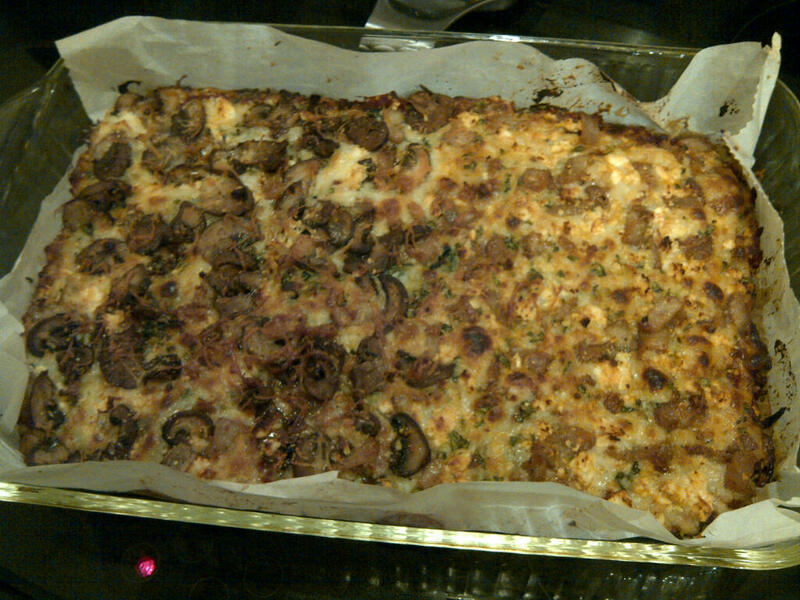 Our Pizza toppings included: spinach sauteed with minced garlic, sauteed crimini mushrooms, left-over pork chop, thinly diced and crisped in a pan, and some crumbled feta cheese, along with the Organicville spaghetti sauce and some shredded mozzarella cheese mixed with chopped fresh basil. 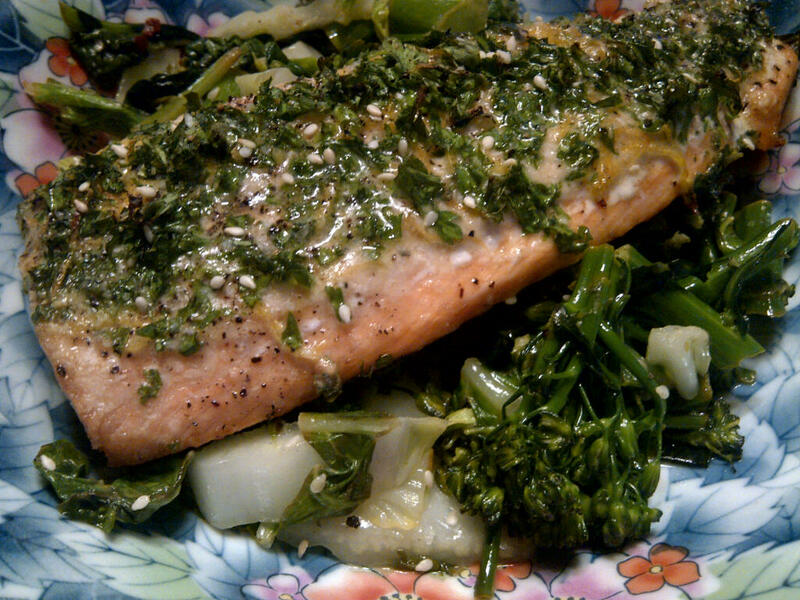 Salmon is my go-to fish of choice! I love that it is insanely easy to cook (400 degrees, 15-20 minutes), and that you can flavor it in so many ways… PLUS it is healthy! We all know by now that it is a great course of healthy fats and omega 3’s, and to top it off, it’s strongly anti-inflammatory. bake 15-20 minutes at 400 degrees. As a side, we sauteed chopped baby broccoli (put in the pan first for 2+ minutes because it takes longer to cook), along with napa cabbage and spinach in coconut oil, finishing with a squeeze of fresh lemon and sesame seeds. If you are like me, you eat plenty of salads, right? I know we love our greens and the health benefits that come with them, but I also get in salad “ruts” sometimes where I know I should eat them, but I also know just how they will taste, and get a little bored with the concept. This morning I didn’t feel like eggs or a smoothie for breakfast, and decided to have a salad instead, so I started looking through the fridge to see what I had on hand. I knew there was leftover orange ginger grilled chicken breast that I wanted to use, and of course greens. 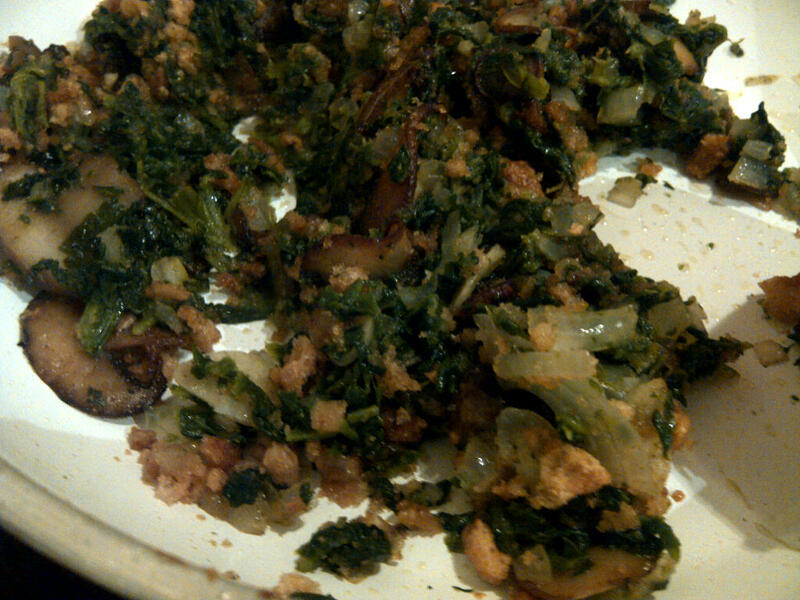 I also had fresh crimini mushrooms, which i love, but the problem is that I only like cooked mushrooms, not raw ones. 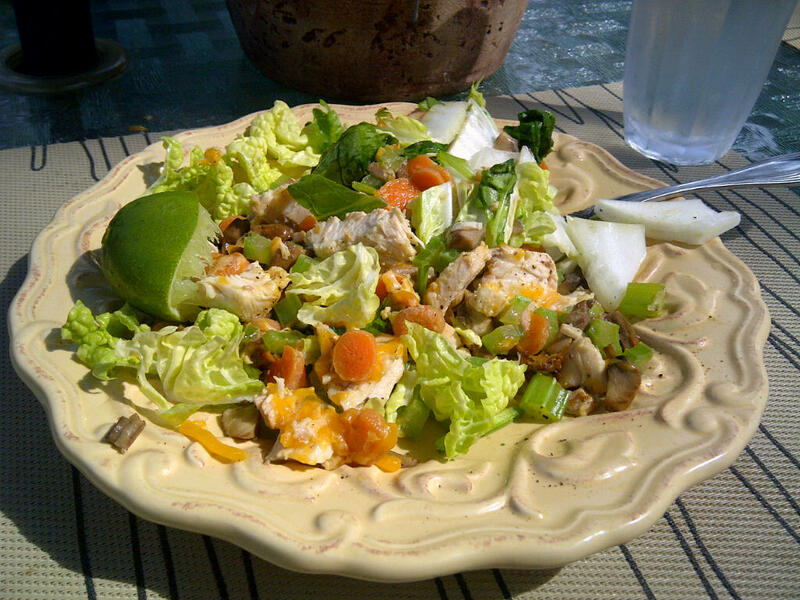 Cooking the mushrooms led to this delicious and light warm salad… for a vegetarian version, simply omit the chicken and cheese and use coconut oil to saute veggies. Having a late breakfast in the backyard listening to the birds singing up a storm was a refreshing start to my day, but I don’t think I will be hungry at lunch time! 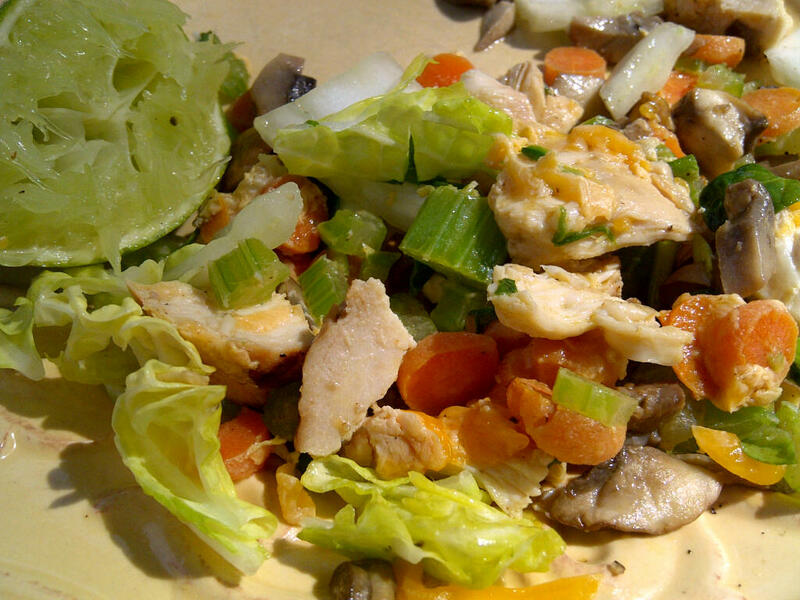 Saute carrot, celery and mushrooms in butter for a few minutes, cooking lightly and maintaining crispness. 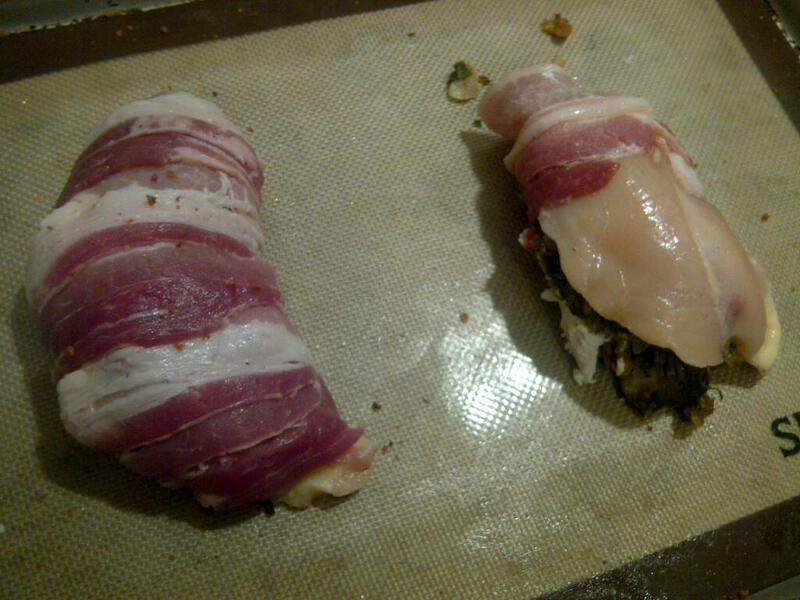 Add grilled chicken and warm through, remove from heat. 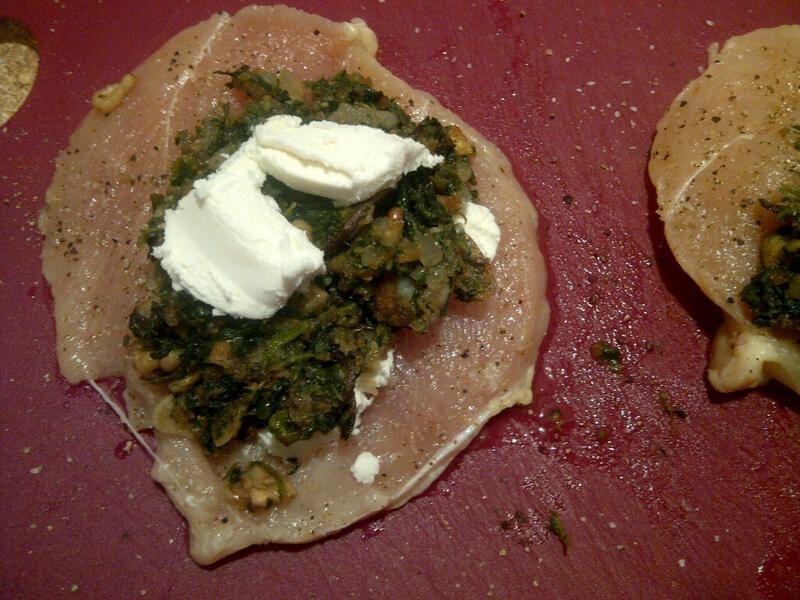 Lay the napa down as a base for the salad, either whole for a wrap, or chopped. 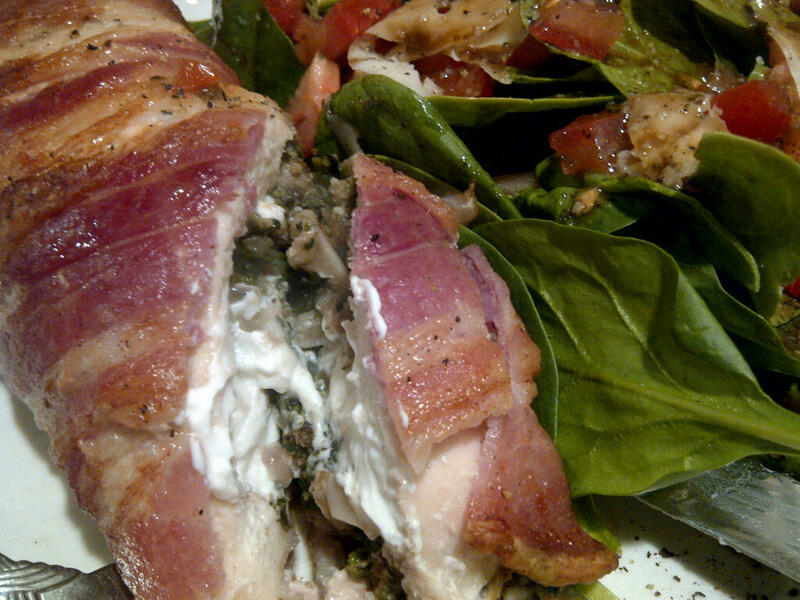 Add spinach over napa. 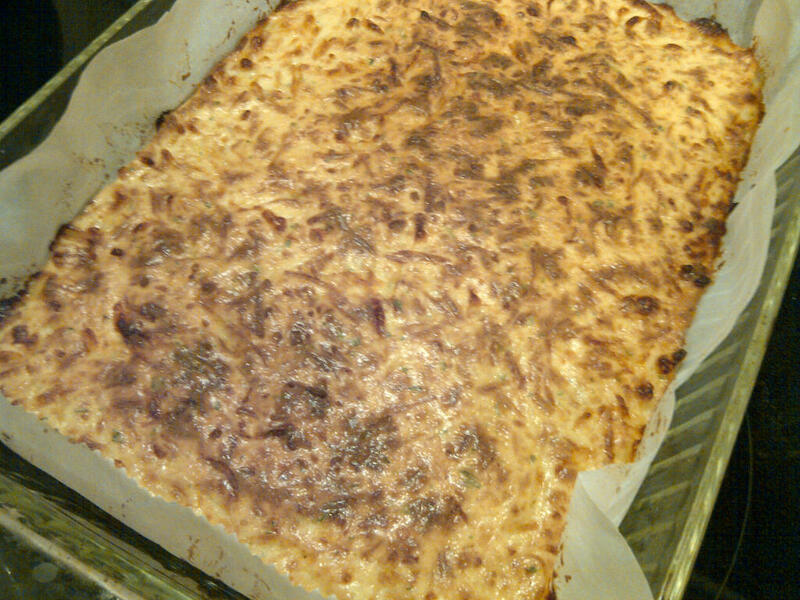 Top with veggies and then cheese. Squeeze lime over the top and serve immediately. We LOVE napa cabbage, and use it almost every day at our house as a salad ingredient, but also as a substitute for bread, wraps and taco shells. It works wonders whether it’s raw or very slightly steamed (which gives it a little more pliability.) 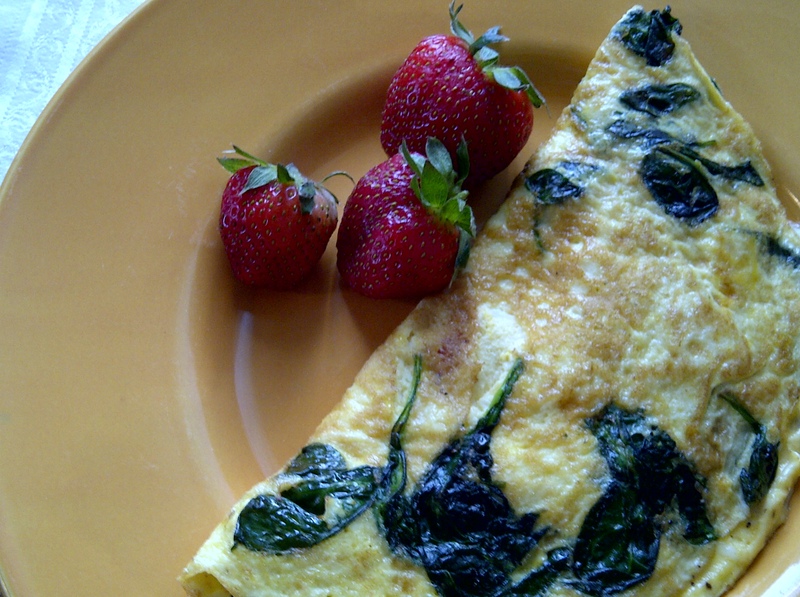 You will surely see more recipes featuring napa in future postings. 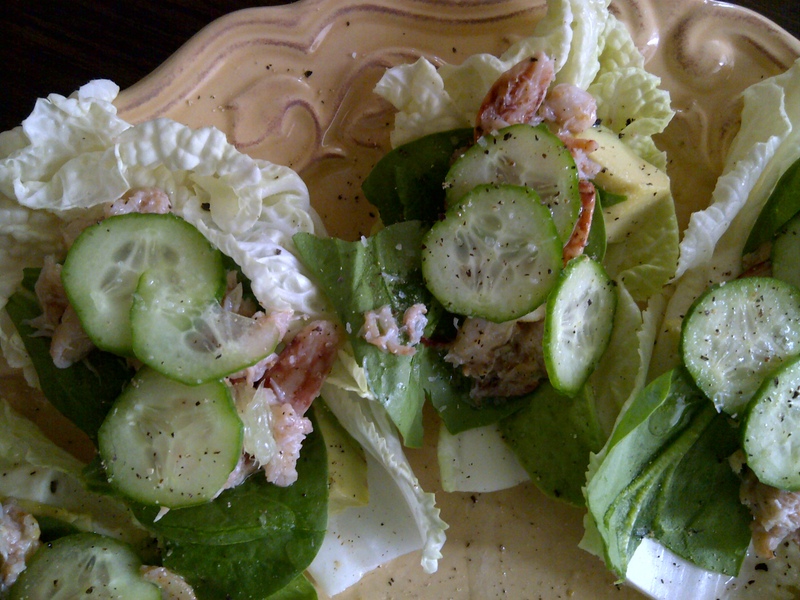 Here, the medium-sized inside leaves were used to make a wonderful raw veggie based snack that was both refreshing and filling! 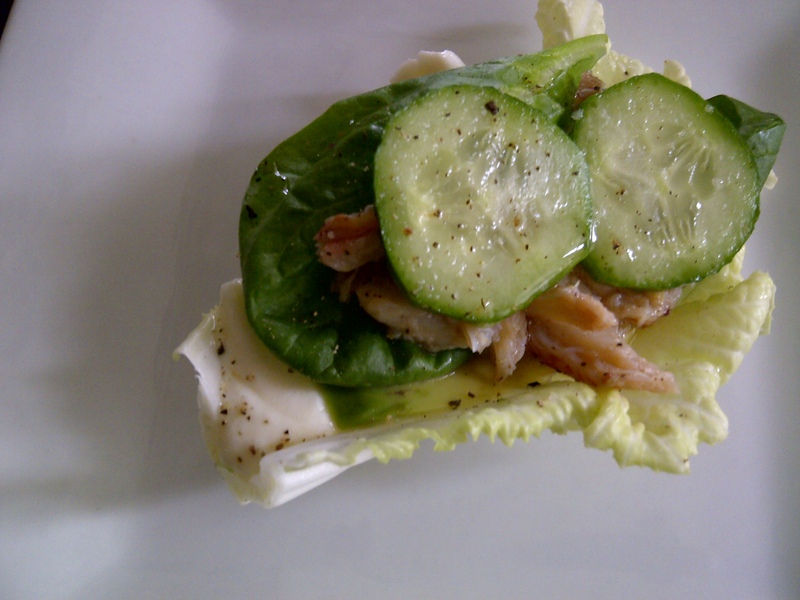 It’s wonderful as it is, but as you can imagine, this is an easy recipe to tweak to your needs or ingredients on hand. I usually determine what we’ll eat by what I find on sale or fresh at the market. I rarely go out looking for specific ingredients unless I am preparing food for guests, or because one of us has a serious craving. The seafood sale at VG’s on jumbo sea scallops is what landed them in my freezer, and pulling them out for Mother’s Day dinner seemed like a brilliant idea! (Except to my son, who won’t eat anything that swims… for him it was crisped ham.) These were particularly large and beautiful, and the 6 scallops weighed just over a pound. While the weather was stunning on Sunday and I considered grilling, scallops are so delicate (and I only had a few), that I wanted to have more control over the cooking process so that they didn’t end up overcooked. That is one of my biggest pet peeves in the food world, going to a restaurant, ordering something that should be succulent, and ending up with an expensive platter of rubbery food. Not that it doesn’t happen to the best of us at times, but ruined seafood makes me want to cry! 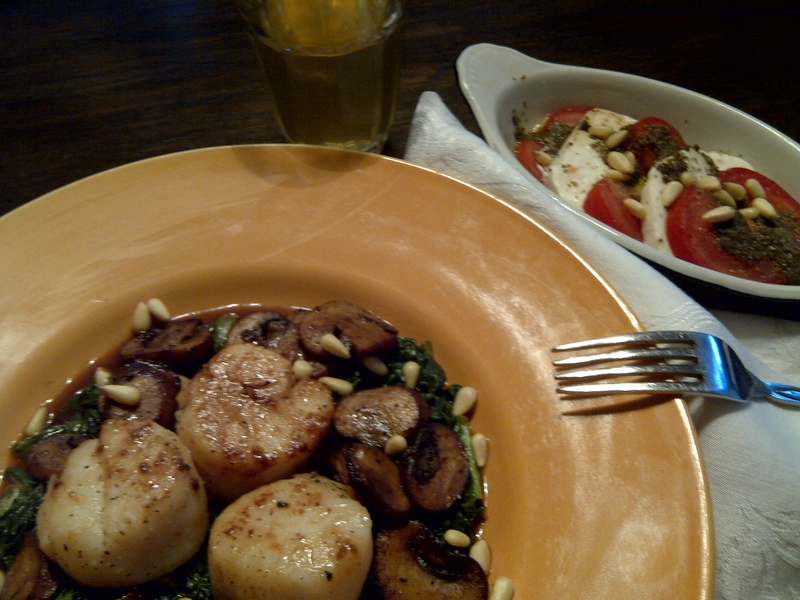 I had fresh spinach and turnip greens in the fridge, along with crimini mushrooms, and decided that they would make an awesome accompaniment to the seared scallops, along with a caprese salad of tomato, fresh mozzarella and herbs. It turned out to be an incredible dinner! 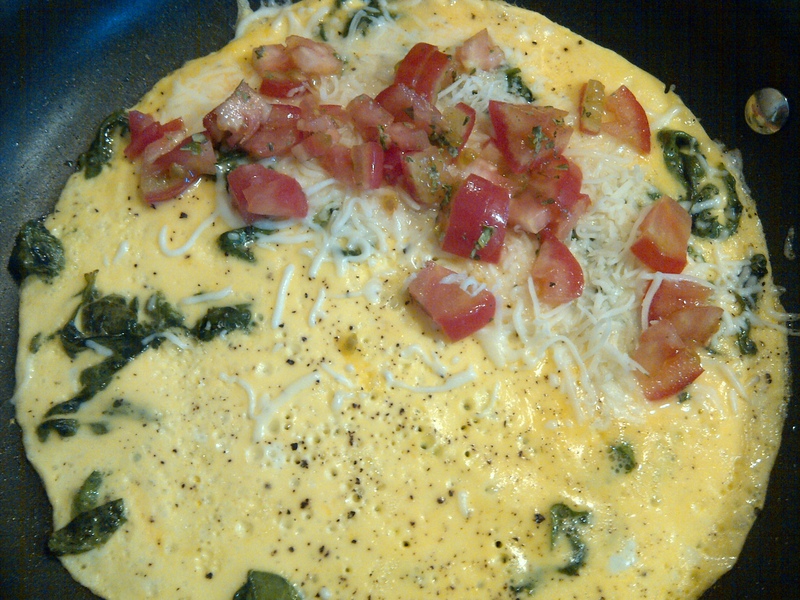 Heat a heavy pan over high heat for several minutes. Add several tablespoons of coconut oil, allowing it to melt and then become hot. 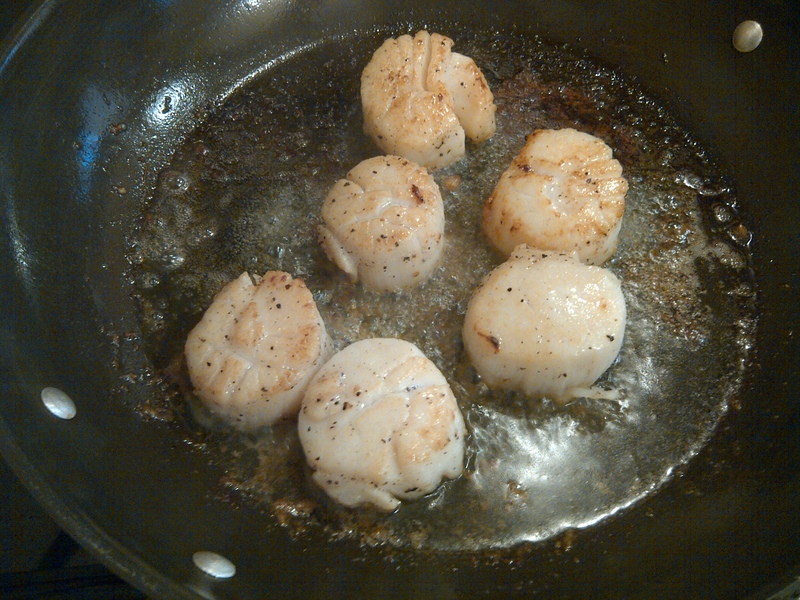 Carefully add the scallops one at a time, searing on one side for about 3 minutes, or until they start to brown. 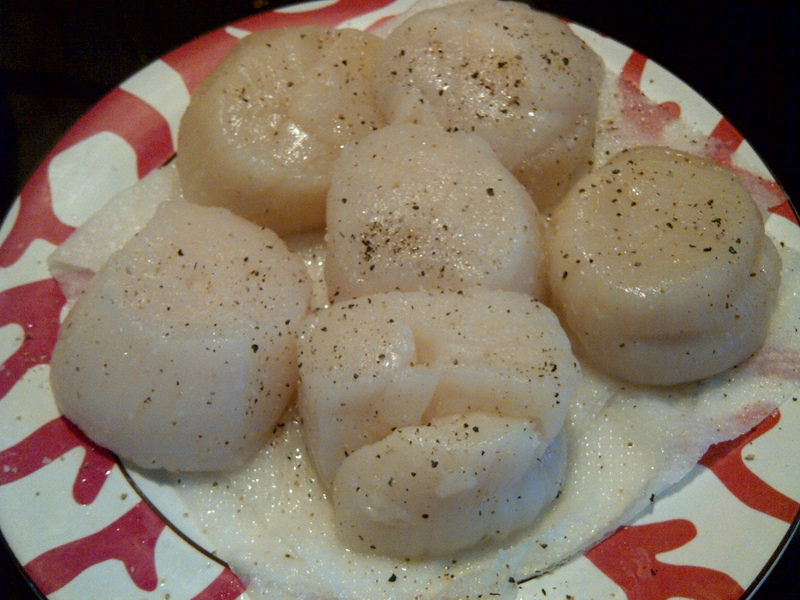 (If using smaller scallops, adjust the time accordingly so that they are not overcooked.) Gently turn scallops, carefully loosening from the pan with a sharp spatula if needed; cook another 3 minutes and remove from pan and set aside. 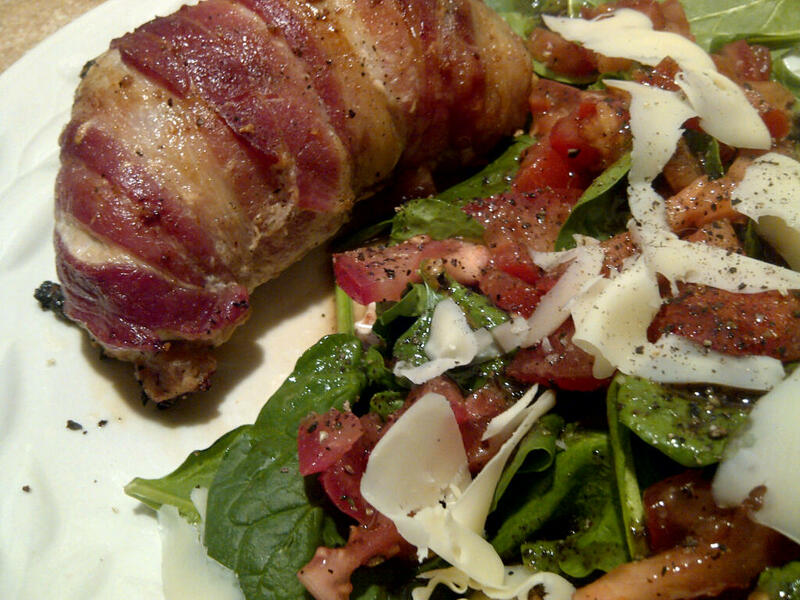 Reserve oil and juices in pan and cook mushrooms as below. Keeping the pan hot from searing the scallops, add the mushrooms, salt and pepper to taste, and cook for 5 minutes or so, until they reach the desired doneness. 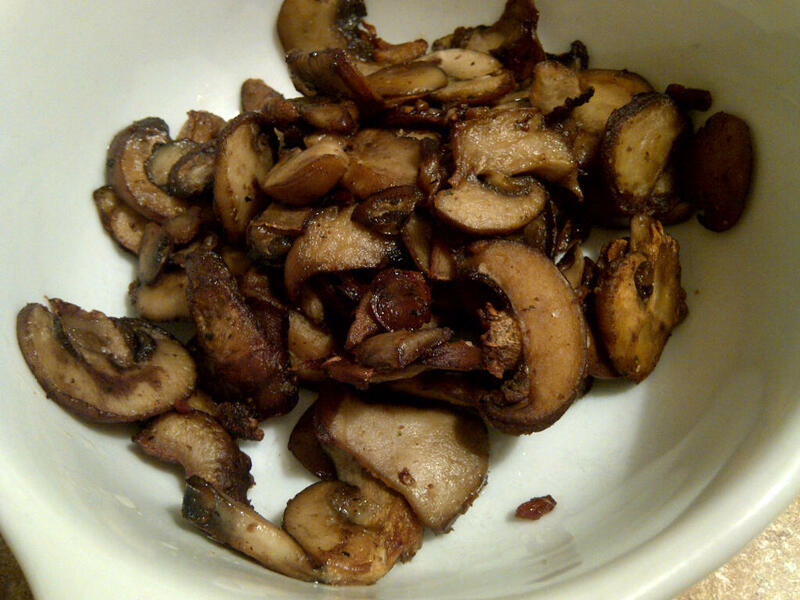 You may need to add a little oil because ‘shrooms can act like little sponges and soak it up. In my case, I hadn’t planned on using the wine, but there was a little stickage at the bottom of the pan (as you can see in the pic) after cooking the scallops, so when the mushrooms were almost done, I just poured in the wine (honey mead actually), and deglazed, working all the stuck bits into a delicious flavoring for the mushrooms. 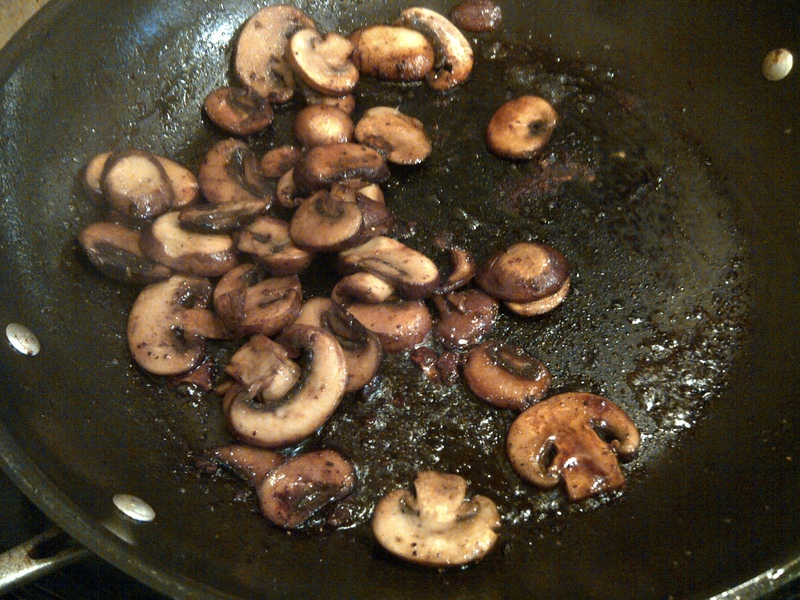 When done, remove mushrooms from pan and set aside. 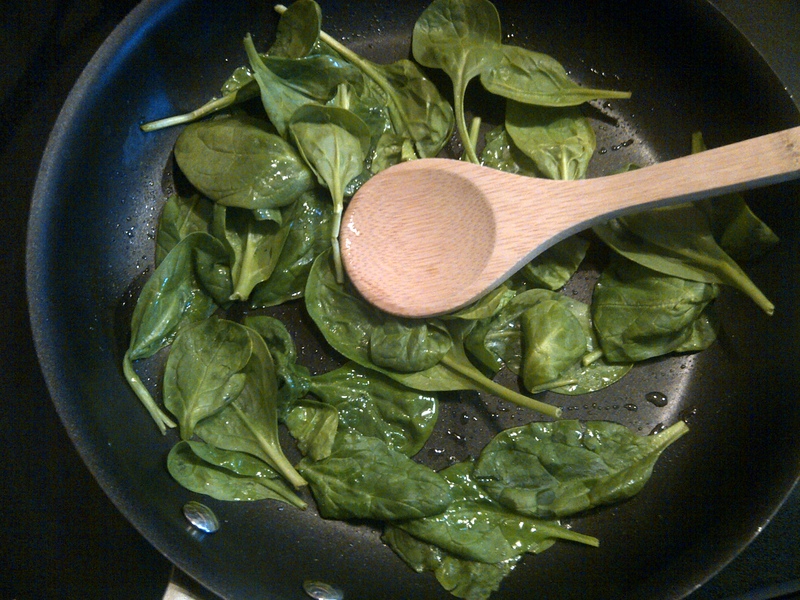 Keeping the pan hot, reserving any remaining juices and oil, and continue to cook the greens as below. 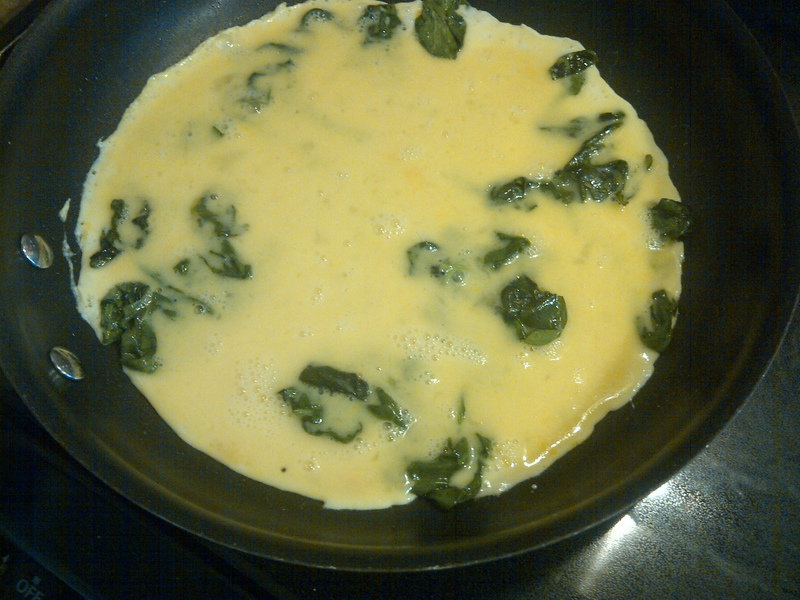 Still using the same pan, melt a little more oil if needed and start adding the greens to the pan. Greens cook down a LOT, so you will want to add them in stages, because they will be overflowing if you dump all of them in at once. 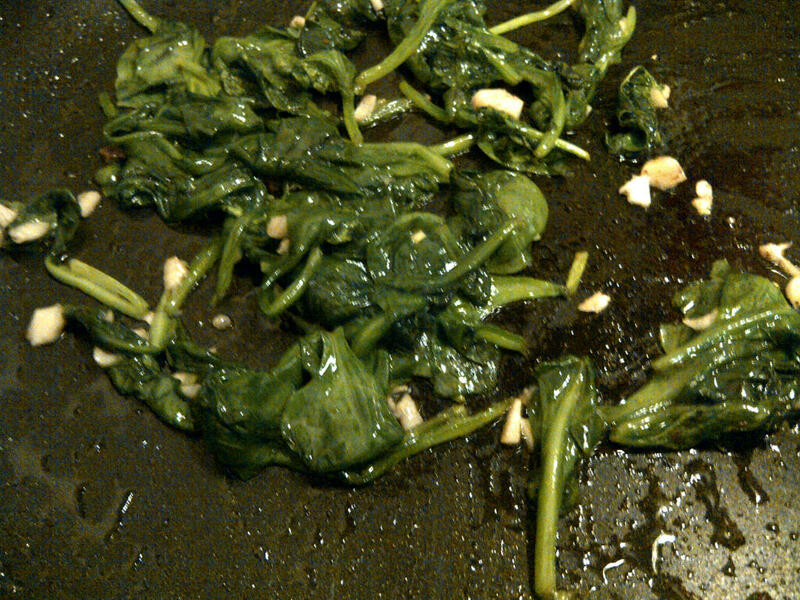 When the greens are wilted, add salt and pepper to taste, and cook to your desired doneness. 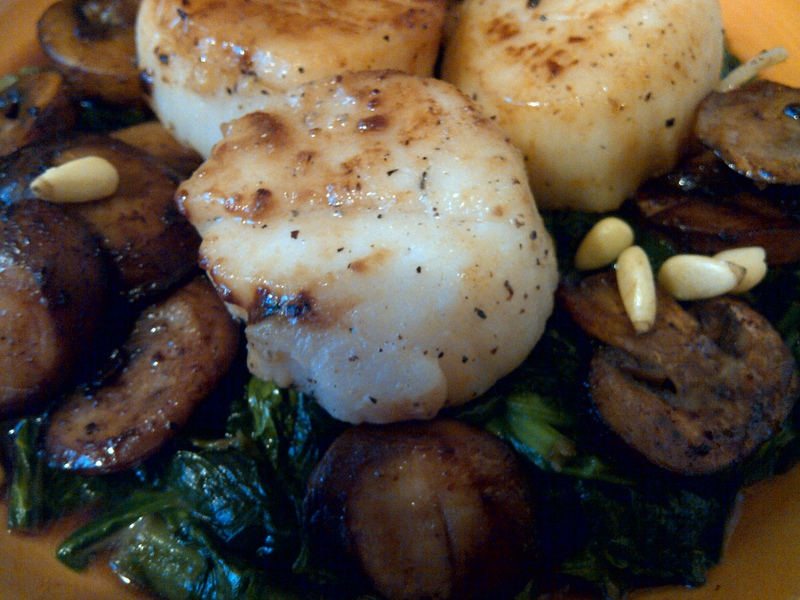 To assemble the plate: Arrange greens on the plate, top with scallops, surrounded by mushrooms. I added a few pinenuts to add another flavor and texture. This is a very easy and elegant dinner, which cooks up rather quickly, using the same pan for each stage of the cooking process, while keeping the ingredients separate and distinct until they are plated.